Eurocom Corporation (www.eurocom.com), a developer of long lifespan, fully upgradable Notebooks and Mobile Workstations is launching the NVIDIA GeForce GT 650M in its 11.6” EUROCOM Monster notebook. “EUROCOM Monster provides workstation-calibre performance, powerful graphics capabilities and high performance storage in an extremely small and lightweight notebook computer. This little guy weighs under four pounds, with a battery, has the power of a full sized notebook, and has 410 minutes of battery life, it’s truly the best of both worlds” states Eurocom President, Mark Bialic. 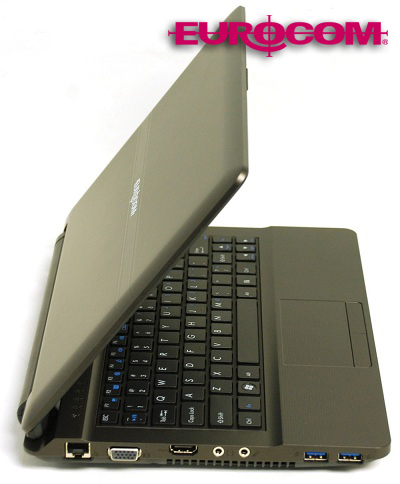 The EUROCOM Monster 1.0 is built with an ultra heavy duty design for unintentional abuse while on the go. It is a fully upgradeable system with support for the best in mobile technology. The Monster 1.0 can be customized based on processor, memory, storage, display and wireless technology. Based on the HM 76 Express chipset from Intel the EUROCOM Monster 1.0 can support up to 8GB of DDR3-1600 memory from two channels. Super powerful Ivy Bridge Intel Core i7 processors and Sandy Bridge Intel Core i5 and i7 processors are supported for high-end computing wherever work takes place. “With a massive 410 minute battery life, thanks to a 62.16WH battery and Optimus technology the EUROCOM Monster is the perfect system for anyone on the go” states Mark Bialic.